Garrison Street Christmas Lights (Point Loma) – this amazing neighborhood covers their homes in shining lights, nativity scenes, Santas, sleighs and so much more. You can drive through, but you’ll probably want to park and stroll down the street to truly enjoy the details. They are ready the day after Thanksgiving until December 31st. Plug this address into your GPS and you’ll find yourself right there! 3663 Garrison Street, San Diego, CA 92106. There are many wonderful neighborhoods all over San Diego that have similar over-the-top decorations. To find a neighborhood closer to you, use this handy map of Christmas Lights. For a unique coastal twist to the holidays, plan to see the 45th Annual San Diego Bay Parade of Lights. Find a Bayfront spot and watch the procession of approximately 80 lavishly decorated boats as they dazzle and entertain on December 11th and 18th, starting at 5:00pm. Outdoor ice skating is a special treat during the holiday season and here are two wonderful choices for this activity. 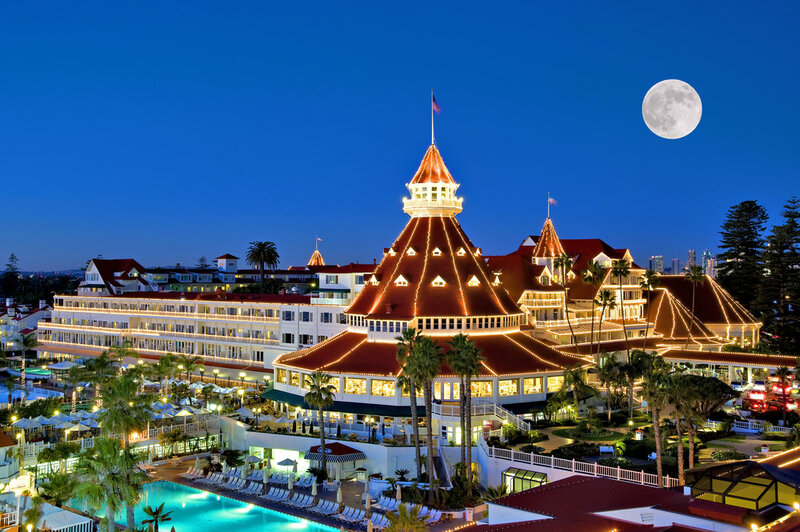 The iconic Hotel del Coronado offers “Skating by the Sea,” a seasonal oceanfront ice skating rink open from November 24th to January 2nd. Visitors will surly feel the holiday spirit strolling through their winter wonderland of beautiful decorations, DELights display, and the spectacular two-story lobby Christmas tree. 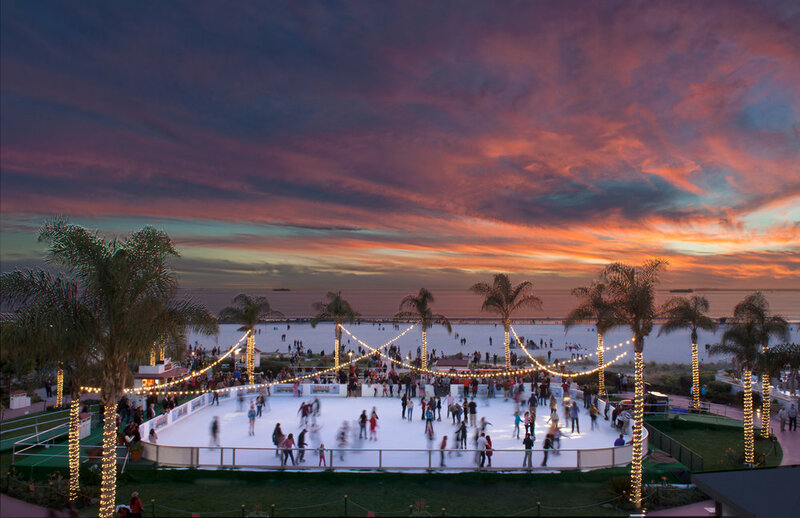 “Fantasy on Ice” at historic Liberty Station begins November 17th with live performances and remains open until January 8th. There are a variety of different public skating times so check here for more information. One hundred percent of profits from this rink benefit Peckham Center for Cancer and Blood Disorders at Rady Children’s Hospital. Visit the World-Famous San Diego Zoo from November 24th to January 3rd to experience “Jungle Bells.” Enjoy an array of holiday lights and animal-shaped light sculptures, ride the twinkle trolley, see the acrobatic trampoline elves, visit with Santa and much more. Celebrate the Holidays at LEGOLAND with a life-size Lego Santa, reindeer and sleigh among twinkling lights, nightly snowfall and special holiday treats. Visit Sea World’s Christmas Celebration to feel a wave of holiday cheer. The 320-ft. tall Sky Tower shines with twinkling lights and all the park’s various shows have Christmas themes. You can have breakfast with Shamu and Santa, visit Santa’s Cottage, see the 40-ft. happiest dancing Christmas tree, and much more. San Diego is the perfect place to experience so many outdoor holiday activities to put you in the festive spirit. Plan ahead to make sure to enjoy all your favorites! Happy holidays! Molly McCrackin grew up in San Diego and has been managing short term vacation rentals in the beach area since 2008. She is the owner and manager of Molly's Rentals - a short term vacation rental company that specializes vacation homes in Mission Beach, Pacific Beach, and downtown San Diego.